What could possibly be so special about this particular park? We know it was laid out in its present shape starting in 1867 but we also know that Ellipse Park was first suggested on the original plans of Pierre Charles L'Enfant, so it's origins go right back to the founding of Washington DC. Before we go any further we should point out that there 'is' something very important about Ellipse Park but it's not something that is generally known. 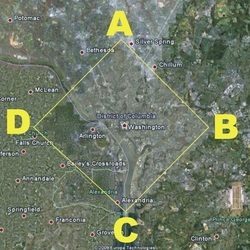 The District of Columbia, within which Washington DC the city stands is diamond shaped, and each of its sides was intended to be ten miles in length. I've highlighted it on the Google Earth picture below so that you can see what the Disctrict of Columbia actually looks like. 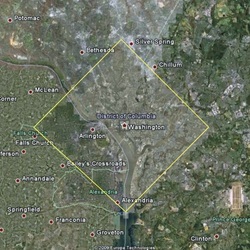 If we were to draw lines to connect up the corners of the diamond, north south and east west, we would arrive at a point that was the absolute 'center' of the District of Columbia. We are sure that those who planned Washington DC were very aware of this. The line that divides the District of Columbia from north to south was meant to run down 16th Street and right through the center of the White House, whilst the line that splits the District of Columbia from west to east was meant to run just north of what is now Constitution Avenue. Surveying the land totally accurately was a difficult thing in the 18th century and a very slight mistake could possibly have been made. The absolute centre of the District of Columbia is a building 400 metres to the west of and very slightly south of the center of Ellipse Park. But for all the reason we will mention, we are confident that the planners of Washington DC considered the centre of the Ellipse Park to be the actual centre of the District of Columbia. One reason we can be sure of this is because of the Prime Meridian. President Thomas Jefferson was aware that the new United States of America needed its own points of reference. In particular he thought that it needed a new 'meridian' - a line running north/south from which all other measurements in the country could be taken. He intended this line to run right through the middle of the White House and therefore right through the middle of Ellipse Park and he had it surveyed accordingly. We know exactly where this line was meant to be because at the very centre of Ellipse Park, and at ground level, is a small, stone block that marks Jefferson's proposed meridian. Now take a look at the picture below.